Here are my take on a couple of recipes that would be perfect for a light summer dinner with friends, with some slight modifications to make as healthy as possible! 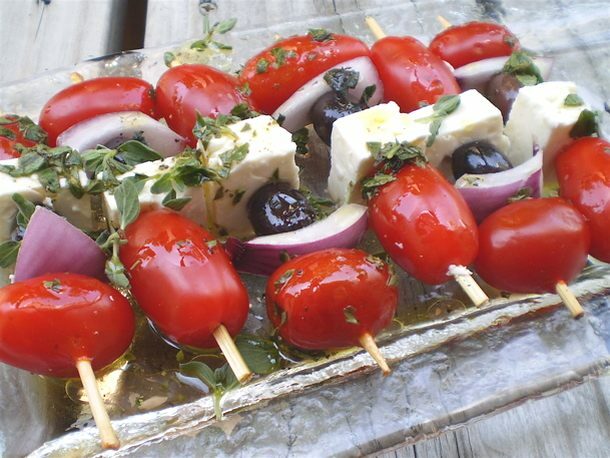 For the Skewers: Thread the skewers starting with a tomato, then a piece of feta cheese, an olive, a piece of onion and finish with another tomato. Repeat with the remaining ingredients. For the Vinaigrette: In a small bowl, mix together the lemon juice, red wine vinegar and oregano. Whisk in the olive oil until the mixture thickens. Season with salt and pepper, to taste. Arrange the skewers on a serving platter. Spoon the vinaigrette over the skewers and sprinkle with the chopped oregano. This salad looks like tricolor pappardelle pasta, with vibrant ribbons of pink, green, and orange melon. If you don’t want to bother making the melon shavings, just use a melon baller or cut the fruit into cubes—the salad will still be beautiful. 1/2 cup turbinado or other coarse sugar — I would use 1/4 cup instead of 1/2 here! 1. Cut each melon lengthwise into inch-wide slices. Hold melon slices at the peel end and use a sharp vegetable peeler to shave long ribbons of melon flesh into a large serving bowl. 2. In a small bowl, combine mint leaves and sugar. 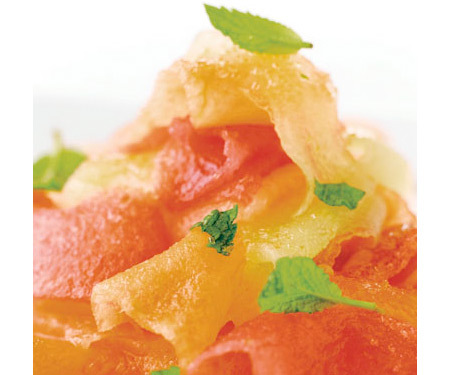 Add mint sugar to the shaved melon and gently toss. 3. Arrange melon salad on individual salad plates. Garnish with fresh mint sprigs and serve. I love watching Giada also. Check out her cookbook. it is gorgeous ! As a fellow Food Network groupie, all I can say is – you got this one right, S! I enjoy watching Barefoot Contessa a lot, and I can take Paula Deen in limited doses – but the butter/oil thing is just way beyond control (how about the Neelys, you forgot them – so much frying!) Let’s not forget some of the other FN shows that depend upon a lot of prepared foods – oh, I forgot to mention Rachael Ray who also uses way too much of her beloved EVOO (extra virgin olive oil, so annoying that she uses that acronym constantly). Still – Food Network is great fun to watch, especially when one is working out – and occasionally is the inspiration for some terrific meals!